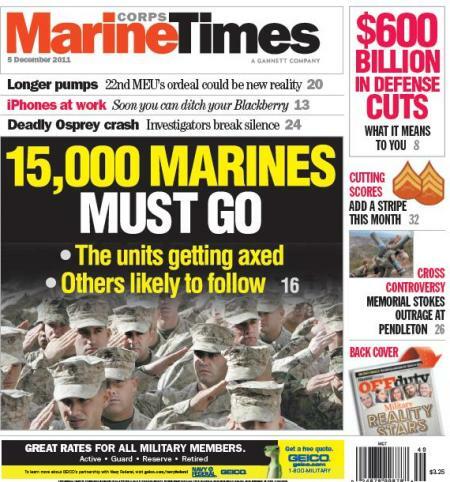 You’ve read some of the details about the coming 15,000-Marine drawdown of the Corps in previous issues of Marine Corps Times. But this report takes it even further. In this issue, you will learn specifics: which units are being deactivated, how many will be reorganized or realigned and where the Corps will actually be adding people and assets. For example, along with the stand down of a historic regimental headquarters and three battalions, several tank companies, field artillery batteries and recon companies will go away. At the same time, the logistics community will undergo sweeping changes, and Marines will be added at MARSOC and Marine Forces Cyberspace Command. There is news for the MP community, the aviation community and for some general officers. It’s all laid out in a by-year time line between now and 2015. Also in this issue, find out whether your next MEU deployment will be longer than expected and take a look back at the pilots who flew the ill-fated MV-22 Osprey that crashed in 2000 with 19 Marines aboard and why some want the record changed to restore their reputations. What a shame,that those who set on capitol hill want to cut the Marine Corp’s by 15,000 to 25,000 Marine’s. To save a few dollars. Consider the fact,that this will be another 15 to 25,000 men and women returning to the private sector work force looking for job’s that aren’t out there. Instead of throwing these young men and women to the wolf’s. Why don’t they consider doing an inter military cross training program. The Navy has admitted,that they are 10 or more ship’s short to handle the deployment tempo of the Marine’s. So why not bring some of the older ship’s back out and staff them with these Marine’s. And while the leaders of are fine Marine corp’s are looking for way’s to make reductions to satisfy capitol hill,why don’t they do away with the air wing totally (except for AV8B’s and helo’s) we don’t need fast attack planes leave that upto the AirForce and Navy. I guess the Corp’s is going back to the day’s where,”we’ve done so much with so little for so long,that we can virtually do anything with nothing”. Bailing wire and bubble gum day’s are come back. You know that we ramped up the fleet for the war and then the surge right? Since we are done on one front and winding down the other we don’t need over force. I think when I joined it was like 190 something thousand then ramped up to over 200,000 shortly after (back in 2004). It just something that has to happen. I love the Corps too, but I respect the fact that our country can’t be expected to pay people with no jobs. There are far too many civilians already taking advantage of that. At least to make up they are allowing this amazing tax incentive to hire veterans and the GI Bill which, if used right, can be used for all types of job types and even getting a degree to get back into government service as either an officer or into a wide array of government agencies.